I had the opportunity to celebrate Mothers’ Day with six wonderful mothers: my wife Alison, my mom Toni, my grandma Joanne, my mother-in-law Jean, my sister-in-law Gemma, and my sister-in-law Courtney. On the menu, among other things, was this beef tenderloin dish, the recipe for which I got from my colleague Richard Lucey (who you may remember from such blog posts as Braised Beef Cheeks). 90 minutes before you want to eat – place the meat on the counter to allow it to come to room temperature. 60 minutes before you want to eat – Preheat oven to 400 degrees. Mix the parmesan and peppercorns together. Roll the beef in the mixture, coating all sides evenly. Place garlic and tomatoes in an ovenproof dish, drizzle with olive oil, and season with kosher salt. 45 minutes before you want to eat – Place the garlic and tomatoes in the oven. They will need to roast for a total of 40 – 45 minutes. Keep an eye on them and remove if they’re getting done more quickly. 35 minutes before you want to eat – Heat a large frying pan over medium-high heat. Add the olive oil then the beef, searing on all sides – about 10 minutes total. 25 minutes before you want to eat – Transfer the frying pan to the oven and cook until the beef reaches an internal temperature of 123. Remove from oven and transfer meat from the pan to a platter or cutting board. Cover with foil and allow to rest for 10 minutes. 15 minutes before you want to eat – While the beef is resting, dress the arugula with the extra-virgin olive oil and the balsamic vinegar (plus some salt and pepper). Arrange the arugula on a large platter. 5 minutes before you want to eat – Carve the meat into thin slices. Place on top of the arugula. 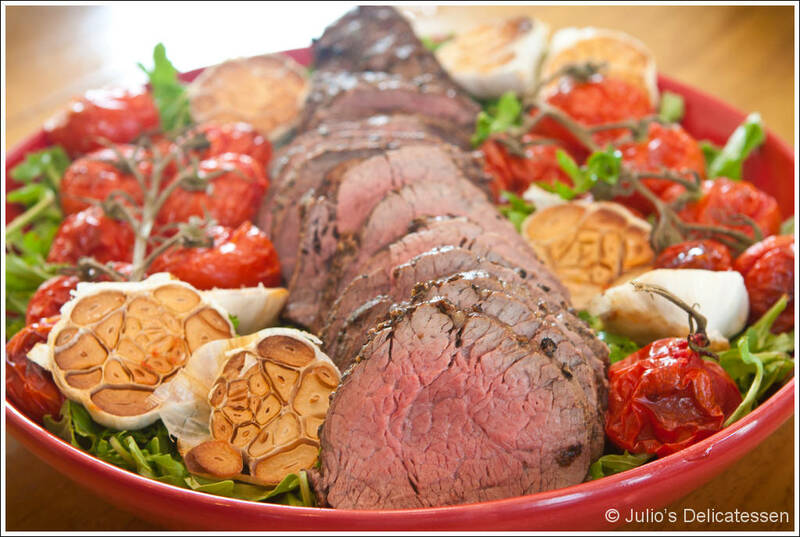 Add the roasted garlic and tomatoes to the platter with the beef. Garnish with shaved parmesan. Not to mention the roasted potatoes, grilled asparagus, salad and Chess pie! It was all delicious. Thanks for a great Mother’s Day – especially the day after you ran a half marathon. What a son! Looks amazing! You can come to cook at my house any day!